If you are looking for awesome trout fishing tips, then you've come to the right place. I have an amazing guide for you. 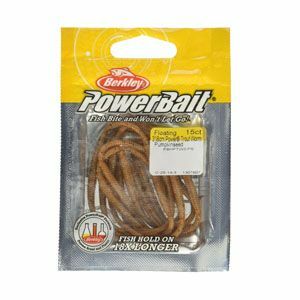 We are going to go through the basics, the best bait for trout, the best trout lures, and many awesome advanced technqiues. Here's a fun fact: Trout fishing is one of the most popular game fish not only in the United States but throughout the world. In the continental US, trout can be caught in waters from coast to coast and in a variety of different types of water systems. 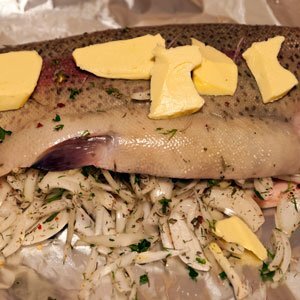 There are several reasons why trout are so popular. For one, the variety of waters they inhabit is generally easy to access and do not require expensive watercraft. 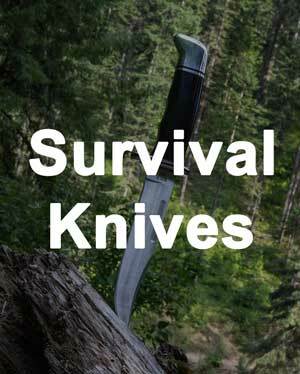 Two, they are also extremely fun to catch on fly rods and ultralight spinning tackle. Another big one is trout taste phenomenal. What I think is the biggest reason trout are so sought after is the finesse and strategy that goes into catching them consistently. It is more than just tossing out a line with bait attached to the end. Trout can be one of the wariest and selective fish species in the US, and this only adds to the appreciation and prestige of catching them. For a fish that has a brain the size of a pea, they are frustratingly able to outwit even the most seasoned trout fisherman. Regardless of your level of experience, this article will refresh you on the basics of finding and catching trout. If you are new to fishing, check out our guide for beginners. 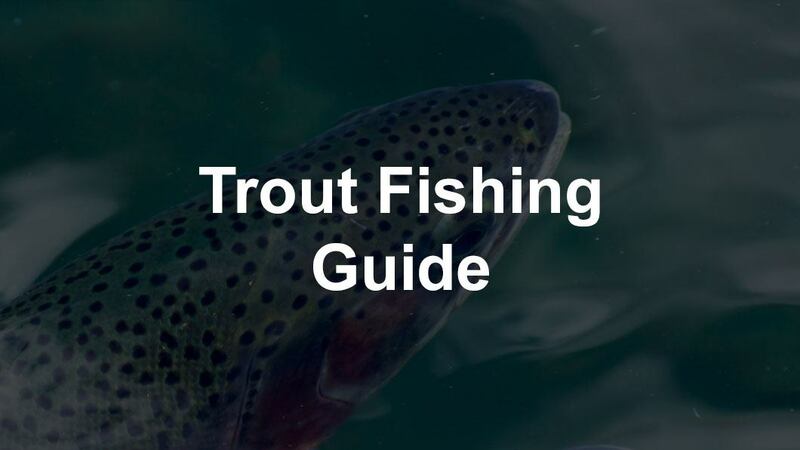 In this guide, we will provide the top tips, including specific tactics for the different trout species as well as the best gear to get the job done. Disclosure: Some of the links in this article are affiliate links, where Trek Warrior makes a small commission at no extra cost to you. While the brook trout is the only native species in the Eastern United States, most rivers have been introduced to the rainbow and brown trout. Brown trout are not native to the United States at all and were brought over from Europe in the late 1800’s. Trout can be found in tail waters, mountain streams, and lakes across the United States. Fishing for trout can also be done year round with the best fishing occurring during the spring and summer months. This is when the water temperature is in the optimal range for fish activity and the insects are abundant. These fish are mostly relegated to river systems that maintain temperatures below 60° F.
When temperatures rise above this mark for extended amounts of time, it can be harmful to trout species. Lake trout can also be found in higher elevation lakes that hold colder temperatures throughout the year. There are two major fishing philosophies for catching this type of fish: spinning and fly fishing. While advocates for either side will argue the merits of their methods until their dying day, what's important is that whichever method you choose gets you onto the water chasing after this beautiful and elusive fish. 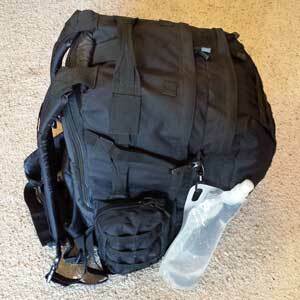 Let's take a look at the specific trout fishing gear that makes up both outfits. 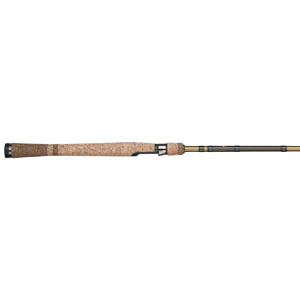 When selecting a rod and reel for trout fishing, you want to go for a combo that will give you finesse and sensitive handling for this trout fishing setup. Trout can feed differently given the day and the hour. Sometimes, their takes feel like a small mouth bass and other days they sip your lure like tea from fine china. Spinning reels that are under ten ounces pair well with an ultralight rod. It is also important that your reel has a smooth drag system. In the case of hooking a larger trout, you will need to utilize the drag to land the fish efficiently. 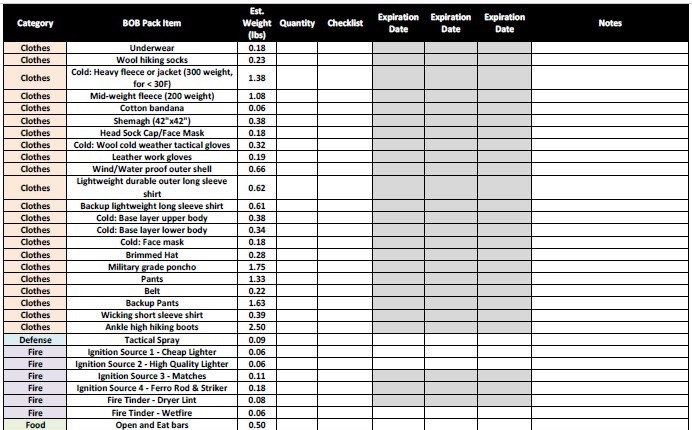 Now let's look at trout fishing rods. As for rod length, ultralights typically range between 5 and 7 feet. The longer rods usually give you a little more casting accuracy and finesse than shorter rods will. Shorter rods are good if you plan on fishing in really tight quarters on some backcountry mountain streams. 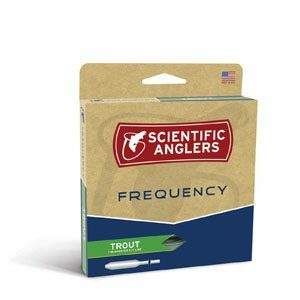 The best fishing line for trout with an ultralight spinning reel/rod combo is monofilament at 10 pound test or less. Anything over that size is just overkill as trout fishing line and might be too large for the smaller spinning reels to handle properly. 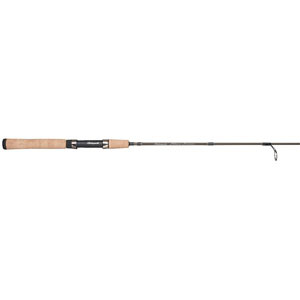 The most common type of rod for fly fishing trout is a 5wt medium action, 9 foot rod. A rod of this size can cast to and handle most trout. Medium action is a great compromise for both distance to your cast, sensitivity, and load speed. Depending on the size of the trout you plan on catching, you may need to adjust the weight of the rod. Small brook trout might be better suited with a 2-3wt rod while large lake trout will need a 7-8wt rod. It's important that you handle the rod before you purchase it. The same goes for a reel. Most fly shops will let you pair them up and get a feel for the balance before making a purchase. Fly reels are also designed to handle certain weights of fly line and need to balance well with your rod. 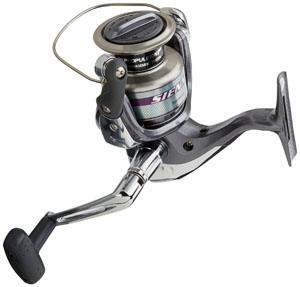 Again, pair a 4/5weight reel with the same weight rod. 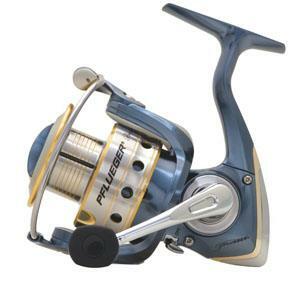 It is also important to purchase a reel that can withstand some abuse on the water without losing its functionality quickly. Like spinning reels, your fly reel should also have a smooth, easily adjustable drag system for handling larger fish that can make distant runs after being hooked. For fly line, you should stay within the limits of your fly rod. If you have a 5wt rod, a 4-6wt line should be manageable. Fly line for trout is often tapered and weight forward, making casting a little more manageable. Floating line is also important to get as most of your presentations include dry flys and nymphs. Sinking line might be an option if you want to go for lake trout as you need to get your lure down to greater depths. For spinning reels, worms are the most often used live bait and will consistently pull trout out of the lake or river. Another popular trout fishing bait is canned corn. Corn is especially effective if you are fishing tail waters with stocked fish. 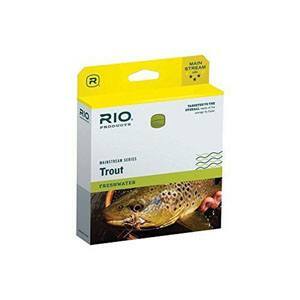 It is very similar to the pellet food that is fed to the trout in hatcheries. A very popular artificial lure that is used with an ultralight reel and rod combo is the rooster tail or other spinner baits. While it does not imitate anything specifically, except maybe a small bait fish, trout seem to key in on them. Besides spinner lures, spoons and plastic jigs can also be very effective trout fishing lures. 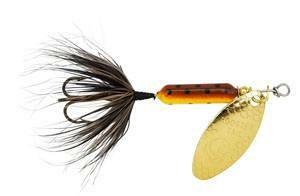 When heading to the stream, it is important to bring these types of lures in several sizes and colors. We are not kidding when we say trout are picky. They may hit a brown rooster tail and not touch a red. Then they might change the next afternoon. You have to be able to test out many different types of fishing lures for trout. While flies are technically artificial lures, we put them in a separate category. Flies are used when fly fishing for trout and are too light to be cast with a spinning reel/rod combo. Fly line provides the weight that is necessary to cast these flies at a significant distance. Flies use various types of animal hairs and feathers along with synthetic materials to imitate a vast array of aquatic insects that the trout eat. For trout fly fishing, it is important to be able to quickly identify the type of insect the trout are keying in on and throwing an imitation of that insect. 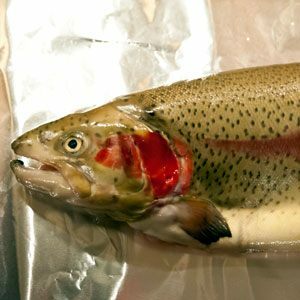 Trout are extremely picky, and if a certain insect is hatching, they will almost eat that insect exclusively. Try your best to match the size and color of the insect that the fish are keying in on. Local fly shops will be able to point you in the direction of what type of flies to use. A lot of fly fisherman also tie their own flies to save a little money and make patterns they feel imitated the local insects better. 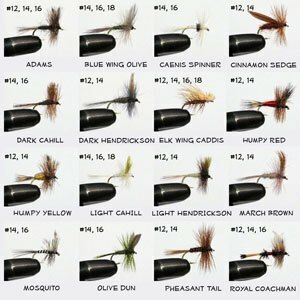 There are fly kits available that can get you started with a large variety of the most popular fly selection. 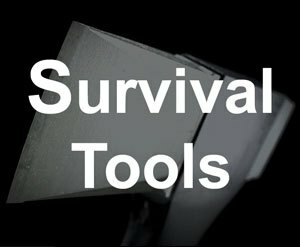 Next, we are going to cover the basics and the top techniques out there. 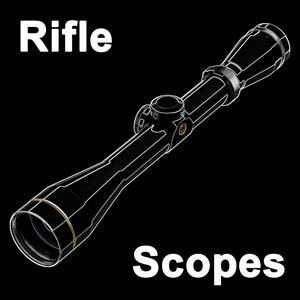 Riffles are fast moving, but shallow water usually over the top of smaller rocks. Riffles most often lead into runs which are deeper portions of moving water and are usually broken up by boulders or other obstructions in the water. Runs eventually lead into pools, which are deeper, slower moving bodies of water. As we discussed earlier, it's important to notice what the fish are going after. Once you get on the water, it's a good time to identify the type of insects you are finding on the water to give you an idea of what type of fly to use. If you are throwing live bait or an artificial lure such as a small jig or spinner this point is not as critical. When picking out a stretch of water to fish, I first look for the transitions between the three different water types we discussed earlier. I especially love fishing riffle to run transitions. The fast current and rock bottom turn out a lot of insects from beneath the rocks and serve as a moving buffet right to the waiting trout. While the trout will hold facing upstream, they do not sit in the fast moving current continuously as they would need to exert a lot of energy just to hold in place. The river brings the food to them, so trout like to find areas in the river where there is a break in the current. These breaks are generally due to some rock or log structure in the water. 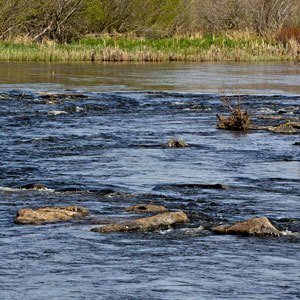 Casting your lure or fly upstream of these positions and allowing it to float past these breaks in the current is a great way of hooking up on some trout. In the river, trout will hold in the water facing upstream. The eyes on the sides of their heads give them a pretty wide visual range to spot floating insects. Because of this, you should fish upstream whenever possible to keep from bumping and spooking fish. It's super important to use proper trout fishing techniques here. When casting, be sure to throw across and upstream when you are floating bait. 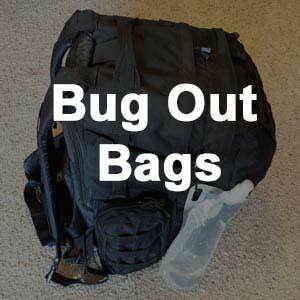 This allows your bait or fly to drift down where the fish will be looking. When retrieving with a spinning reel or fishing a streamer with a fly rod, you have more options regarding where you cast. A lot of fish are taken by throwing across pools downstream and retrieving up through the current. This imitates bait fish struggling very well and can lead to a lot of takes. When working a stretch of water, fish it like Alvin C. York picks off a flock of turkey. If you don’t get that reference, it's a great time to brush up on your classic American cinema and WWI history. A great film is Sergeant York, starring Gary Cooper. What we mean is don't cast to the head of a good looking hole and drag your line and lure through the entirety of it. Start from the back and slowly make your way forward. You spook a lot less fish this way and increase your chances of pulling more than one fish out of each hole. 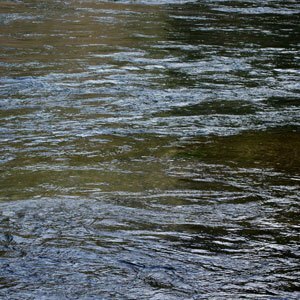 If you are fly fishing, it is vital that you have a good float on your fly. The fly should float without any visible drag just like an actual mayfly dun or nymph would. We said trout were picky and wary and we mean it. Drag coming off of your fly will turn trout away from your presentation time after time. One thing that makes trout so appealing to anglers is the fight of the fish once it's hooked. A 3 pound trout on a fly rod or light spinning reel/rod combo feels like a 10 pound smallmouth. The other side to this is that trout will fight to absolute exhaustion and even until their death. While fighting trout is a unique experience, it is important to land the fish as quickly and efficiently as possible. Utilizing your drag setting correctly and keeping the pressure on the line will help you do that. Along with that, trout are soft scaled fish. Because of this, rough handling of the fish with dry hands can lead to abrasions in the scales and possible infection for the fish. If you are planning on catching and consuming it's not a big deal, but if you plan on catching and releasing you should always handle a fish with wet hands and a net and pliers to remove the lure and release it back into the river. Let's take a look at the most abundant species of trout found in United States waters and briefly talk about some tactics and tips for each species. Brook trout can be found in spring creek streams, freestone streams, and even stocked in tailwaters. The brook trout is most often sought after in the high elevation mountain spring creeks. Brook trout in high elevation streams rarely crack the seven-inch mark, but the coloring of these fish is tremendous and worth the hike to find them. The streams they are found in are usually small and tight and require lighter rod and reel combinations, especially for fly fisherman to fish comfortably. They will take all manner of live and artificial bait. However, they do spook easily, so it is very important to cast to a potential spot and then move on. Rainbow trout might be the most abundant trout in America's rivers. You can consistently catch these trout in the 12-20 inch range. They put up a fantastic fight. Rainbow trout are also found in most trout streams and seem to be the most willing to hit dry flies when major hatches are occurring. As far as rainbow trout fishing tips, when fishing larger tail waters, if you land a rainbow out of a good looking hole, keep working that hole for several more minutes. 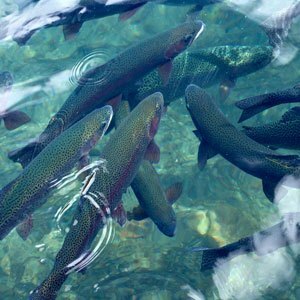 Rainbow trout have a feeding pecking order, and where there is one, there is most likely a few others feeding in that same hole. The one you caught is potentially the trout at the top of that pecking order, meaning there will be more ready to be caught. When the brown trout was first introduced to the US in the late 1800's, it was at first held in disdain by the American trout angler who was afraid of it outcompeting the local rainbow and brook trout. A couple of hundred years later and the brown trout has turned into a trophy for the trout fisherman. Brown trout are usually your best bet of catching a trout in the 20-30+ inch range. In the river ecosystem, brown trout are the major predator and the largest of them feed almost exclusively on smaller baitfish and young trout. They still feed on the normal live bait, lures, and flies, especially the yearling browns. If you are interested in a mature brown, lures that imitate baitfish or streamers for fly fisherman are perfect for this scenario. Large brown trout tend to hang out in great cover, including under outcroppings of rock or banks. These areas also tend to be in slower, deeper areas of water. Play around with retrieval speeds, and you might end up with a trophy brown on the end of your line. Fishing for lake trout is a bit different than fishing in the river. A lot of lake trout will localize to deeper parts of the lake. In this case, it is important to get some extra weight on your line to reach those depths quickly. Lake trout can also grow to much larger size than the average trout taken from a river. They can reach up to 30-40 pounds. You should adjust your tackle accordingly. Not all lakes can hold lake trout. Lake trout need colder water temperatures that do not reach above 60° F throughout the lake. Even in lakes that hold these trout, their position in the water column will change based on the season. A fish/depth finder is an excellent tool to have in this situation or you can use trial and error of putting your bait or lure in different sections of the water column. A boat will also make fishing for lake trout a bit easier as you are more limited to areas you can fish when stuck on the bank. Bank fishing can be productive just after winter and early spring when the trout may be at shallower water levels feeding. As the days get progressively warmer, fish will move to deeper, cooler waters. As for bait, the standard night crawler will almost certainly land you a few lake trout. For artificial lures, the general spinners, spoons, and jigs can catch lake trout as effectively as other species. Again, at certain points in the year, it will be important to weigh down your lure to get it to depths of up to 45 feet. In general, lake fish tend to group up, so if you find the right depth and hook one there will most likely be others in the general vicinity. Fishing trout has been a pastime, addiction, and even a lifelong pursuit for many American anglers over the past 300 years. It is not only the anticipation of hooking and fighting with a large rainbow or brown. Nor is it just the stalking of a small brightly colored speckled trout in some remote mountain range. Beyond those is the environment you are in when fishing. The running water, the wildlife; it puts you right in the middle of their territory and pits you against one of the pickiest and wariest fish we can chase after. Even with years of trout fishing experience under your belt, these fish can skunk you from time to time. I don’t necessarily think that is a bad thing. 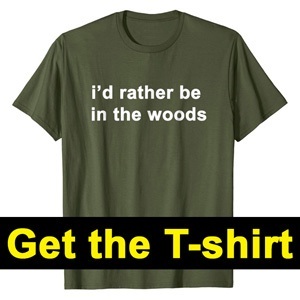 If anything, it makes us more passionate about outfoxing them during the next outing. It keeps us coming back for more and creates even more interest. 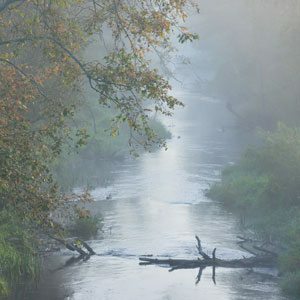 Whether you are using a spinning setup or a fly rod, what is important is that we are out on the river chasing trout. We hope this guide to trout fishing will serve as your resource for getting out on the water and catching fish. If you implement these strategies, you will catch fish and begin to pick up the details that only make trout fishing much more enjoyable. And once you get good at it, you can even put together a little kit with everything you need to catch some fish if things get bad. Before you head out to the lake, brew you up some hot coffee and keep it fresh with a thermos. Got a great Trout fishing story to share? Let me hear about it in the comments below! Huston has spent over 18 years chasing trout, deer, turkey, and game birds across the Southeast and Midwest United States. 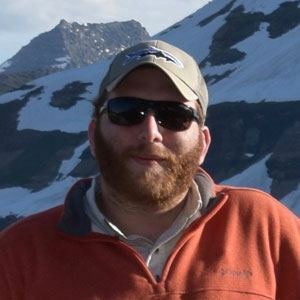 As the founder of ​Discovery & Learning Writing Service, he enjoys helping businesses generate trustworthy and quality material in the outdoor, science, and education fields.